This free Graduation SVG is perfect for someone suffering from Senioritis. 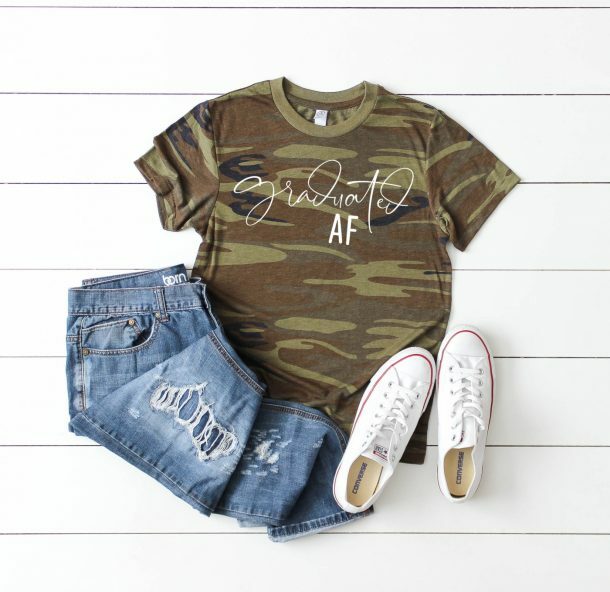 Create the perfect tee to wear under their graduation cap and gown. The day High School ended was a glorious day for me, if only I had this shirt! 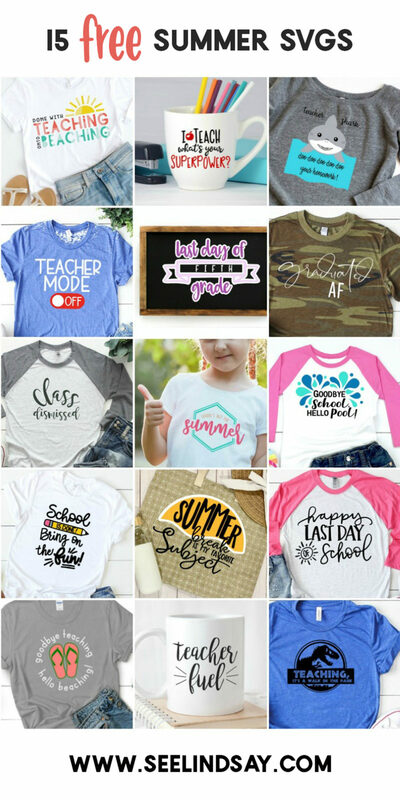 Cricut or Silhouette wasn’t around yet so making your own shirts wasn’t very affordable but now it can easily be done in as little as 10 minutes. 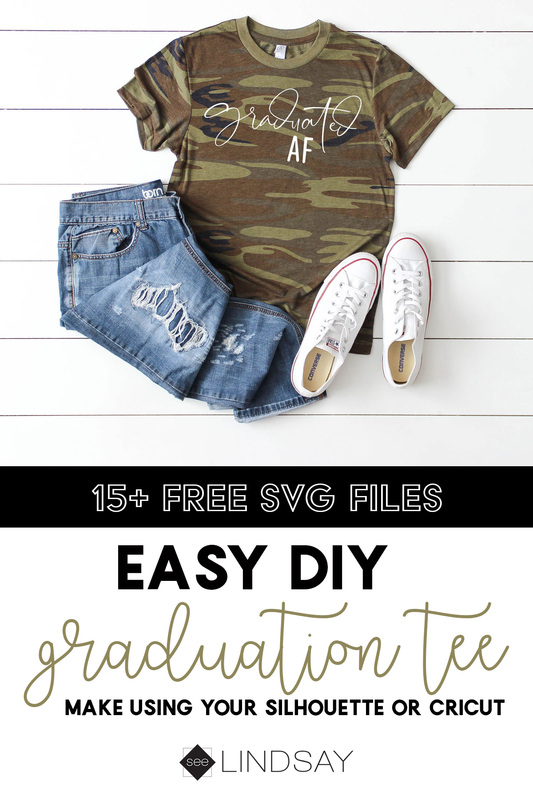 Grab this free Graduation SVG file to make your own today just in time for graduation. If you’re using an Iron to adhere your HTV to a shirt, read these instructions here for all my tips and tricks. If you’re using an EasyPress, read these instruction here to learn how to adhere your Iron On to your shirt. If you’re unsure of what to buy or use, this comparison from Hey, Let’s Make Stuff gives you all the information you’ll ever need. I love my EasyPress but I also do not have space in my home for a Heat Press. Her comparison is definitely helpful in figuring out what you want to use when making T-Shirts and other items. If you only have an iron, it works great but there is a learning curve on how to make your HTV adhere better. We’ve been busy making these adorable Summer SVG Files for you guys. We’ve always had great success in our holiday series of FREE SVG’s we offer you so we wanted to do an end-of-school/summer theme of SVG’s. Grab all the free files below. 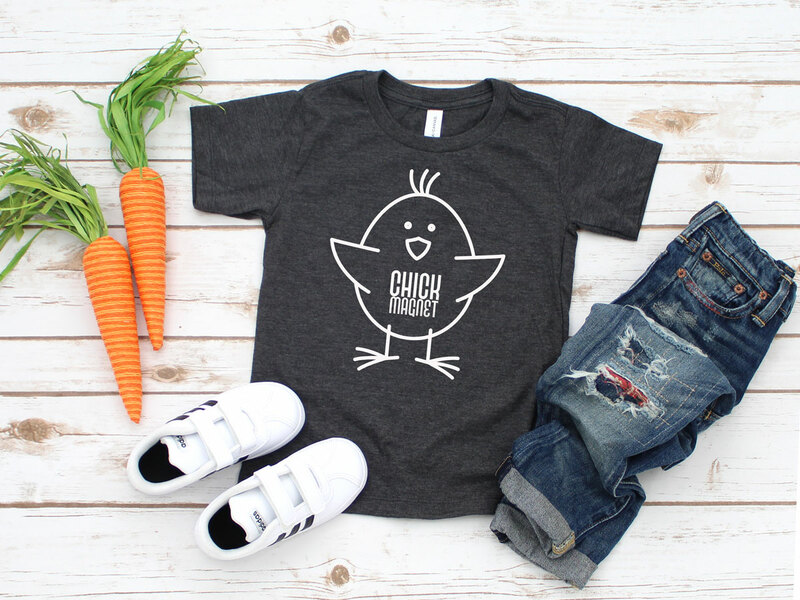 Spring is not complete without a DIY Toddler Easter Shirt for the cute babes in your life. 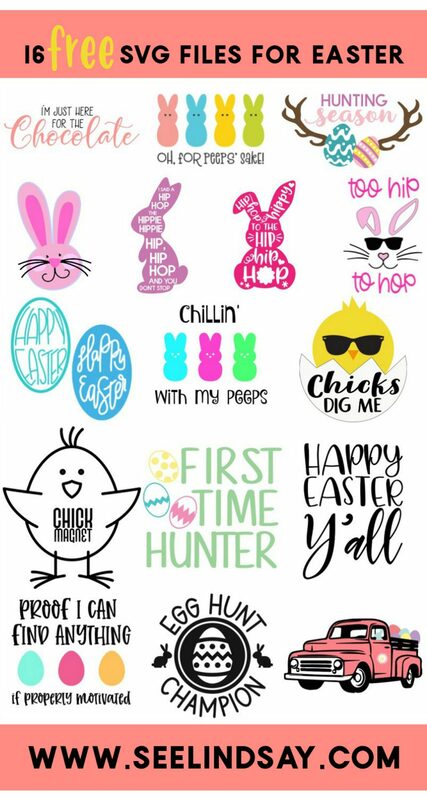 Check out the FREE Easter SVG file and grab 15 more from our monthly free SVG blog hop. These monthly free SVG files myself and other bloggers have offered have been a huge hit with all of our readers. 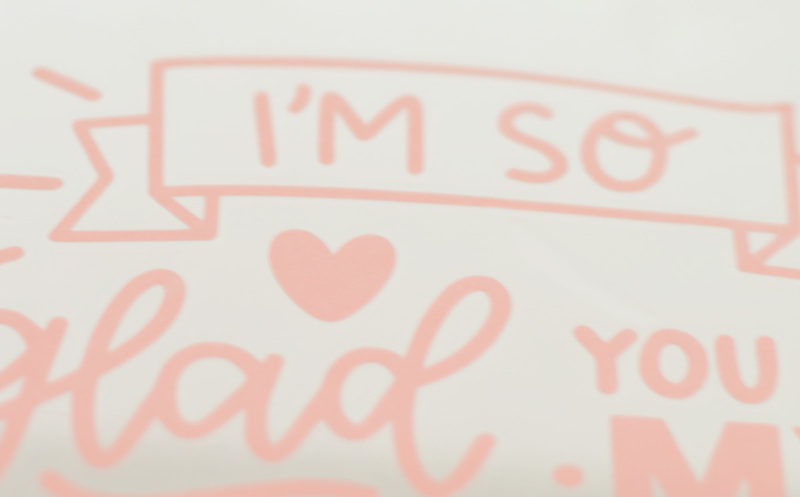 We’ve created everything from Christmas mugs, Valentine t-shirts, and cute tote bags all with our free SVG files. 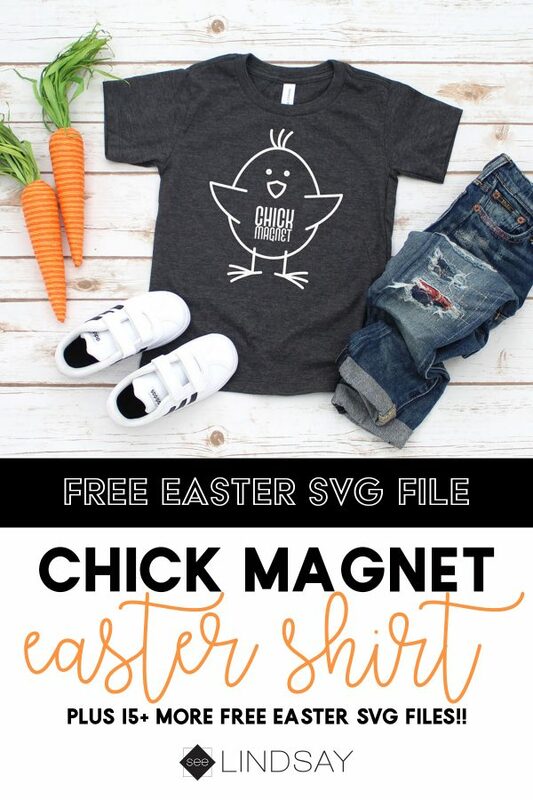 Get your FREE Chick Magnet SVG file here. 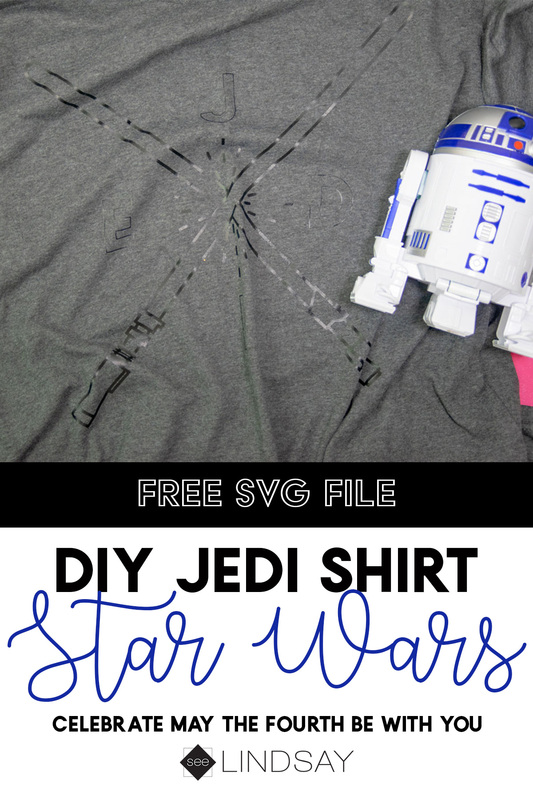 Using HTV on a shirt is very easy. After you have uploaded your SVG file into Design Space or you’ve uploaded the SVG file into the Silhouette software, you want to mirror your image before you cut. Lay your HTV on the mat shiny side down. This carrier sheet will hold your entire image together for you. After you’ve cut, remove any unwanted HTV from the carrier sheet. 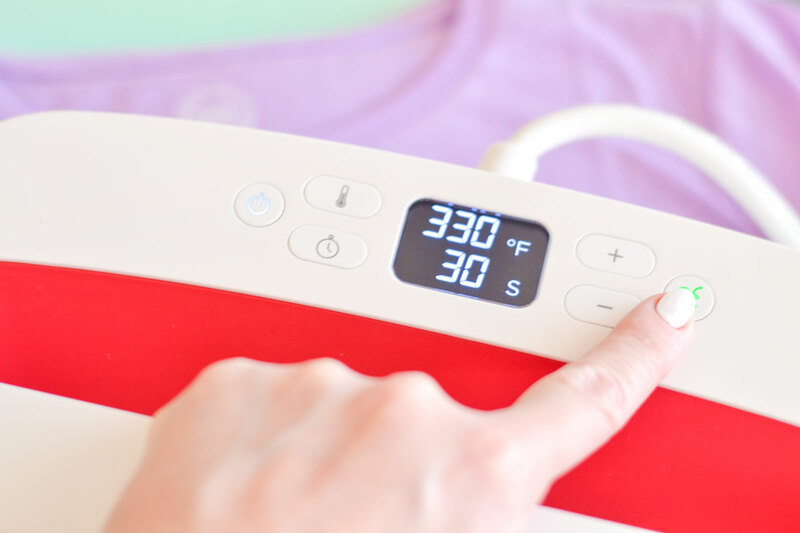 Prepare your toddler t-shirt for the HTV by preheating your fabric. This will remove the moisture from your fabric and allow the HTV to stick better and not lift. Using a folded towel on a sturdy surface is perfect for pressing the HTV to your shirt. Do not use an ironing board. It is too bendy in the middle (that’s a term) and it doesn’t allow even heat to be distributed. Follow manufacturers instructions on the heat settings so that you can be sure to get the right seal of the HTV. That’s it! Grab the 16 FREE SVG files below from each blogger. These are available for personal use only. 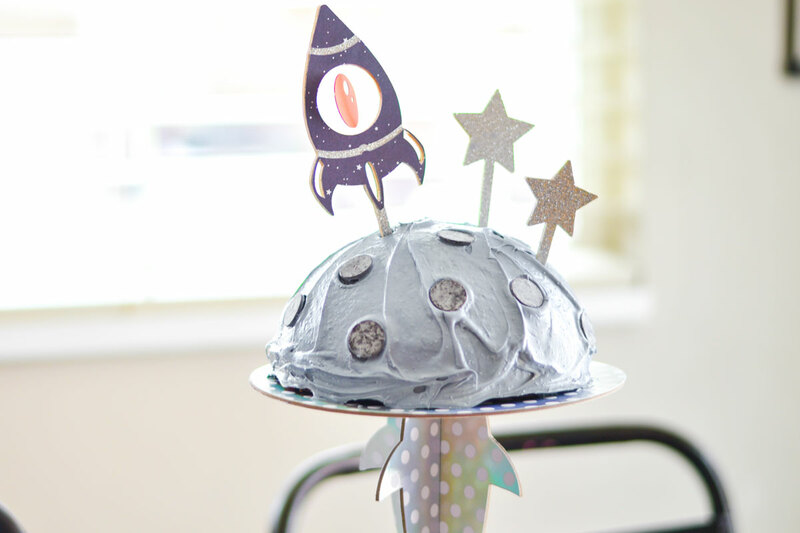 DIY Rocket Cake Stand That’s Out of This World! 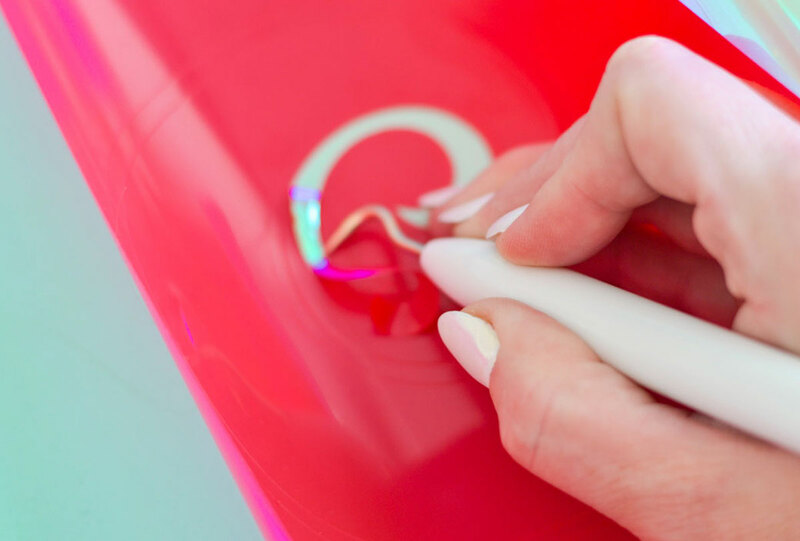 Have you really pushed the limits with your Cricut Maker yet? Making custom cake stands out of wood or custom cake stands out of chipboard is easier than ever. 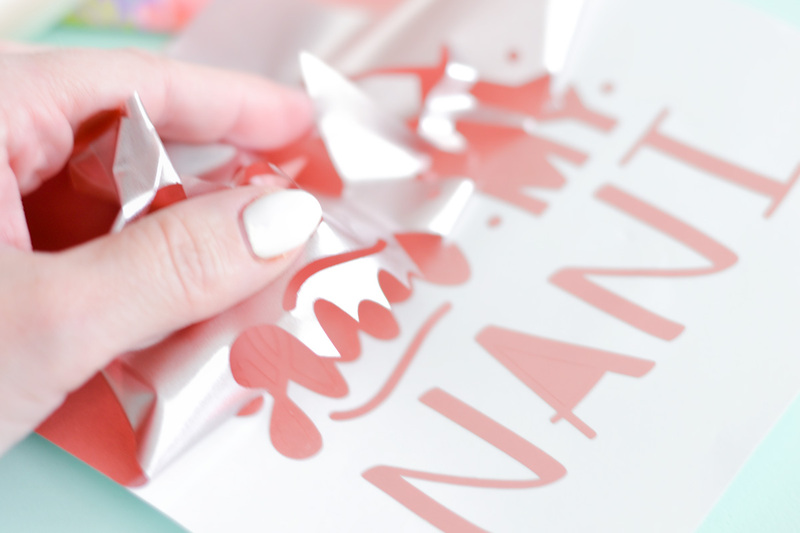 Utilize the Cricut Knife Blade in a way you never thought before. 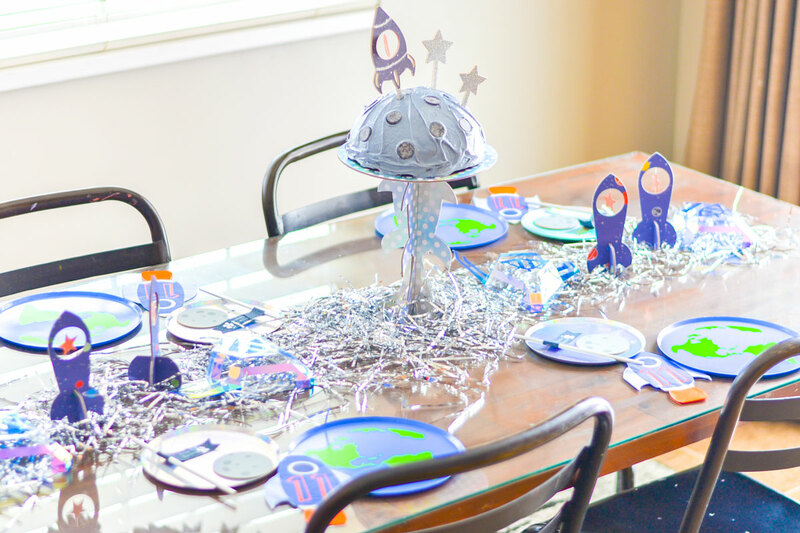 I, like many other mothers, enjoy making a birthday party better than ever. I don’t like to spend that much money buying custom things that will most likely never get used again. Creating this custom cake stand using my Cricut Maker was one of the most genius things my friend could have ever thought of. When you’re making your own custom cake stand with the Cricut, you have to look at the dimensions of everything. Your cake, the width of the shape, your cut allowance on the material, and the thickness of the material. Begin by pulling up the shape that you want to cut. Look for a shape that has a wide bottom and straight line for stability. The top doesn’t have to be as wide because we’ll square it off to make a flat surface for the tray. To do that, move your object to the latitude and longitude of 0. Click on the shapes on the left-hand side and add a square. Click on the lower left lock and then set your square to about 2” tall and an inch or two wider than your shape. Select both the square and the shape and hit the slice function. If Design Space has the sliced feature grayed out, it means that you have more than the two layers selected. You will have to ungroup your main shape if it has more than one layer. This will create a flat surface on the top of your shape and then you’ll duplicate it. Measure the thickness of your material. Some will already be labeled for you on the box or use a ruler. Select the shape icon again and add another square to your canvas. Click on the lock to unlock your square and size it so that it is wide enough that both pieces will interlock. When using the chipboard and some My Minds Eye cardstock, I used the width of .1”. You want the height of your small line to be a smidgen over half. This custom cake stand was 10” high so my squares were .1×5.3”. Duplicate that square. Now use one shape and have one square centered towards the bottom of the shape and the other square centered on the other shape on the upper portion. Use your slice function again like when we made our shape originally flat. There are additional clouds on this cake stand because it would be pretty wobbly without it. Just adhere two to each portion of the base to create a squared up leg of the DIY cake stand. 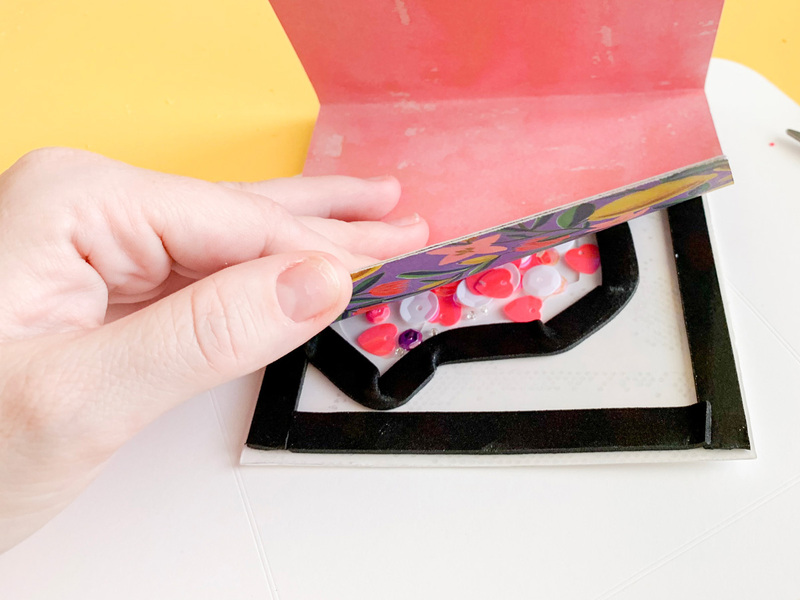 Adhere your material to your Strong Grip Cricut by using some painters tape or masking tape. Just whatever you have around that will also peel easily off your material. Move your star wheels all the way to the right before you load your mat into your Cricut Maker. After you’ve hit your load button, make sure your Knife Blade is in the Adaptive Tool System and hit Go! This certain cut took me about 3 hours. 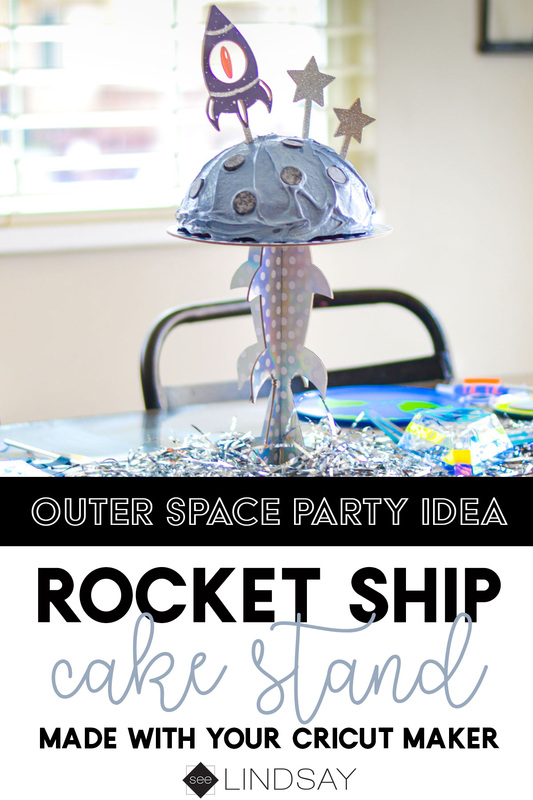 This rocket ship cake stand does not have a bunch of weird angles, they’re all pretty straight. When you cut the cake plate area, that cut will maybe be 4 minutes because it is just a simple circle. How so I glue Cricut Chipboard? I’ve gone over this a few times and have learned that you cannot mix dry adhesive with a wet adhesive. I ran all of my cardstock through my Xyron Creative Station and then adhered it on top of my chipboard. 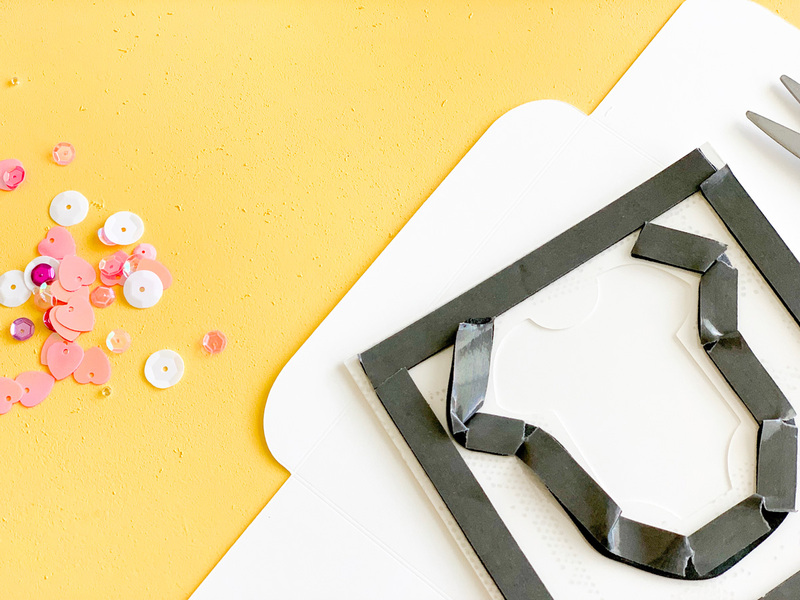 To adhere to the smaller peg pieces to the larger chipboard cake stand, use some hot glue and use it on the edges and then adhere the edges to the corners of the base. My Knife Blade cut through my Cricut Maker! Yes, this can happen. You need to pay attention to your cuts because some cuts may not need all the 20 passes. The Cricut Maker has had instances where it started cutting into the mat and then into the machine. This is not normal but I also don’t know how Cricut will warranty the machine in those cases. Just watch your shape throughout the cut and even closer as the cut comes towards to the end. Can you modify the Cricut Knife Blade settings? No. Cricut Knife Blade material settings are not yet modifiable. This is because Cricut does a lot of research on the back end of the Makers materials and these are the settings they’ve used and tested. I’ve never been able to edit my tools and select a Knife Blade for any of those because if Cricut doesn’t have it listed in the materials section, it probably didn’t work out for them and so they don’t want you ruining your machine. 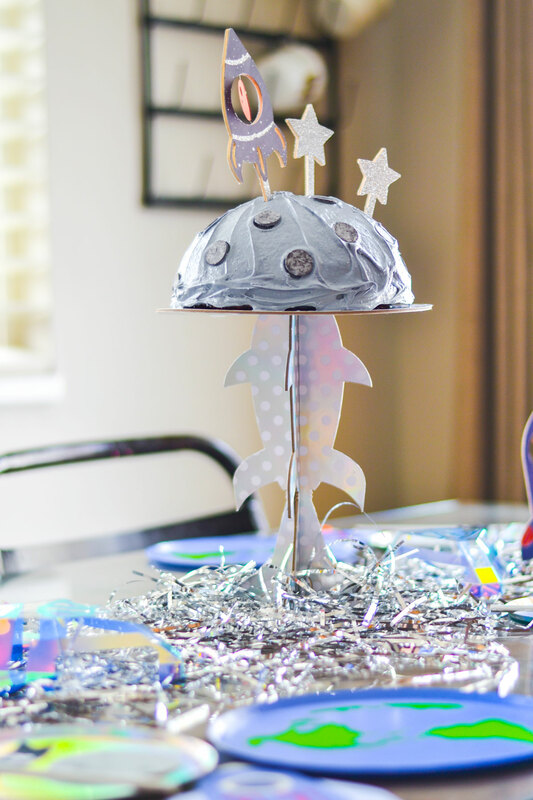 To learn how to make your own wooden cake toppers using your Cricut, click here. 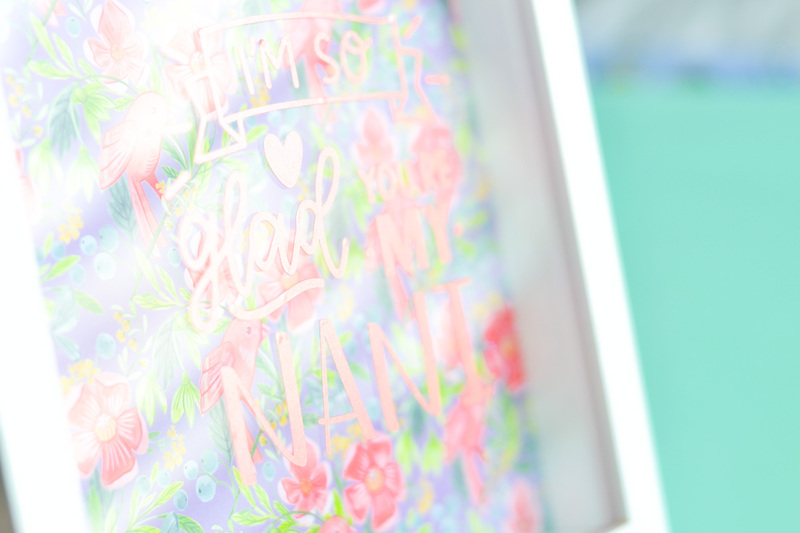 Mothers Day Shadow Box using your Cricut + a Cricut Giveaway! 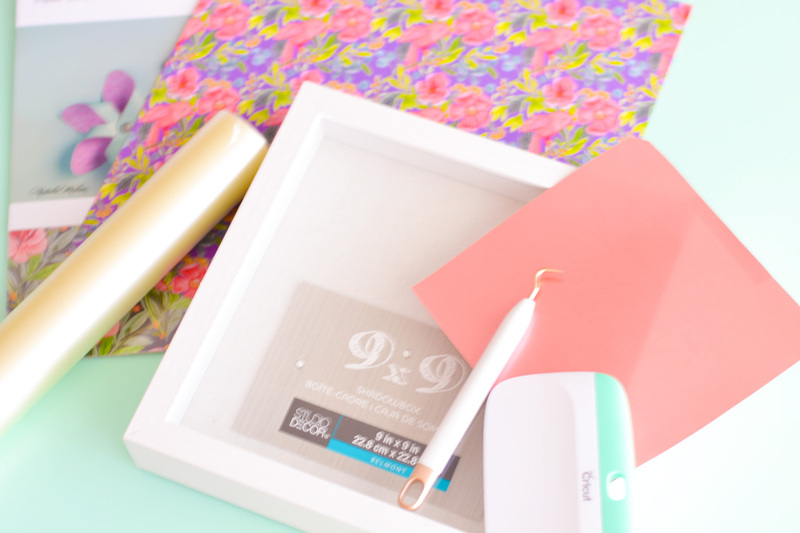 Create the ultimate Mothers Day Shadow Box without much effort at all by you. 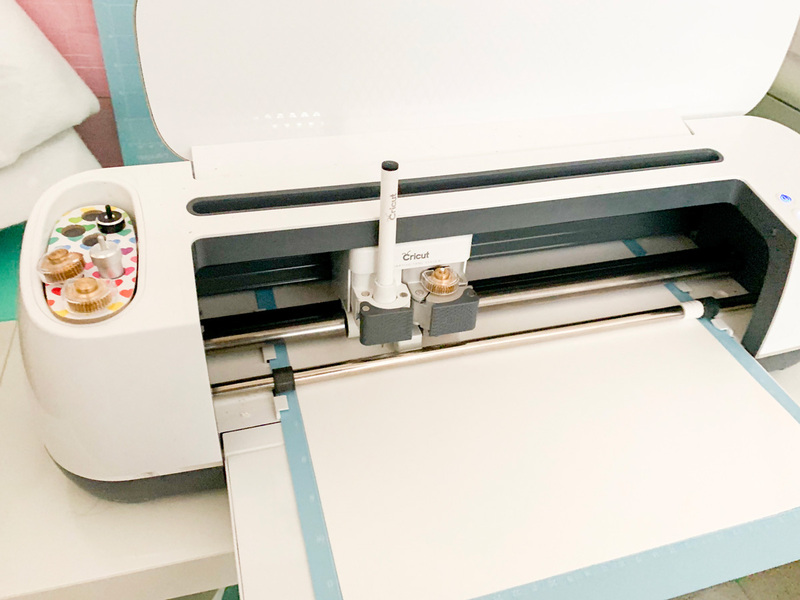 Let your Cricut do all the work and learn how you and your mom could win your very own Cricut Explore Air 2! Making Mothers Day Gifts are always a fun thing to do but it can be hard to come up with ideas. I love that I can open up Cricut Design Space and I’ve got all the inspiration right there! 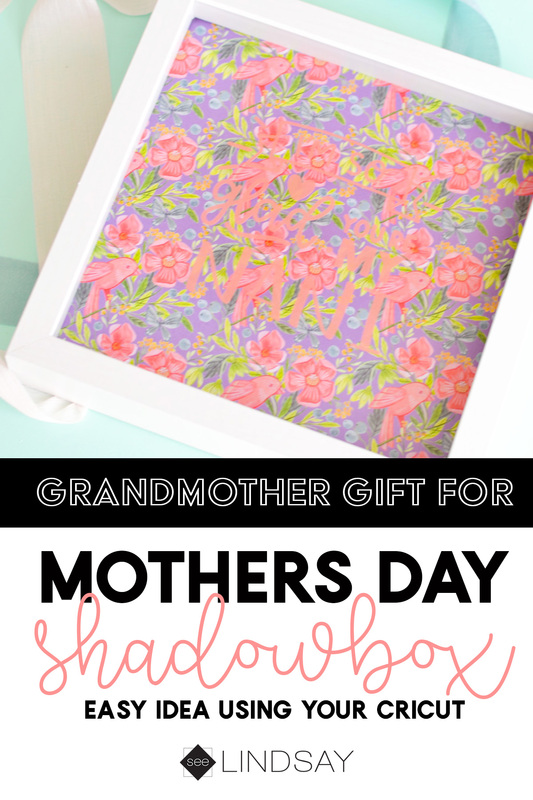 Creating a Mothers Day Shadow Box can be as personalized as you want. Add some paper flowers to the backdrop or just some beautiful scrapbook paper. My kids call my mom Nani and so when I saw this one shape that said MOM, I just used my contour tool and clicked on that word to remove it. I added in Nani using the Felix font in Cricut Design Space. I used some brushed metal vinyl and cut it on the Adhesive Foil setting and had it pass two times. It gave the perfect kiss cut to the vinyl and made it a dream to weed. Weed your image and then apply some transfer tape over your vinyl design. Use your scraper tool to give it a gentle rub and then remove the white backing off of the vinyl. Next, lay it on the glass and then use your scraper again to gently rub the metal vinyl on the glass. Gently pull off the transfer tape and then remove the back off of the frame so you can add your background. I used this Natalie Malan scrapbook paper available at JoAnn and it’s insanely beautiful. She makes the most perfect compositions and the colors are always on point. I used her fabric from Coats to make these cute American Girl jumpsuits and I love the detail. Cut the scrapbook page to be 9×9″ so that it would fit perfectly in the shadow boxes available at Michaels Stores. I realize this a busy pattern and so it can be hard to see if it’s not in the right light but the pinks go so well with the rose gold vinyl. In person, you can see the shimmer of the metal vinyl and then the softness of the watercolor flowers and birds. That’s it! 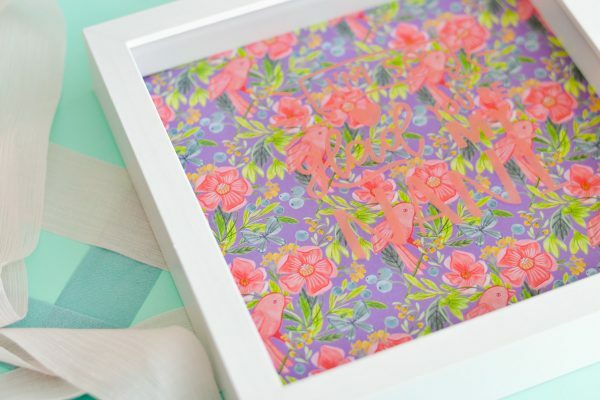 It’s so easy to make a shadowbox using your Cricut. You can always use a solid color of scrapbook paper and then add paper flowers on top for more details but the design in the paper was enough for me. 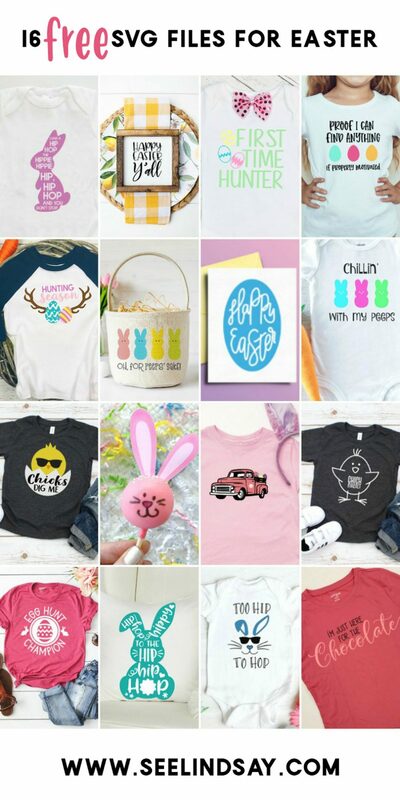 Go crazy and have a blast using your Cricut making Mothers Day Gifts. Now for the giveaway! 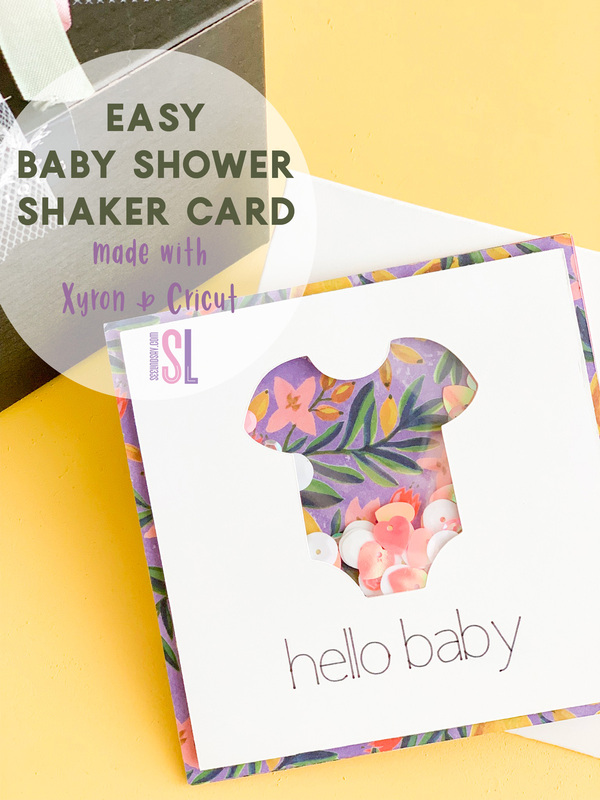 You and your mom can win your very own Cricut Explore Air 2 and a gift card in the amount of $125 for the both of you! You can’t beat this giveaway and you’re going to be a pro in no time. 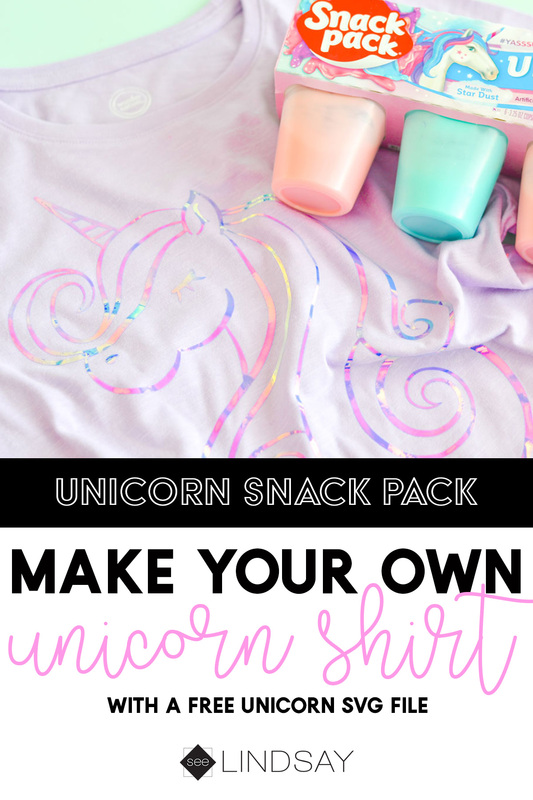 Making a Unicorn shirt is as easy as 1, 2, 3 using this FREE unicorn SVG file. You’re going to make a believer out of your child once they see what you’ve made! 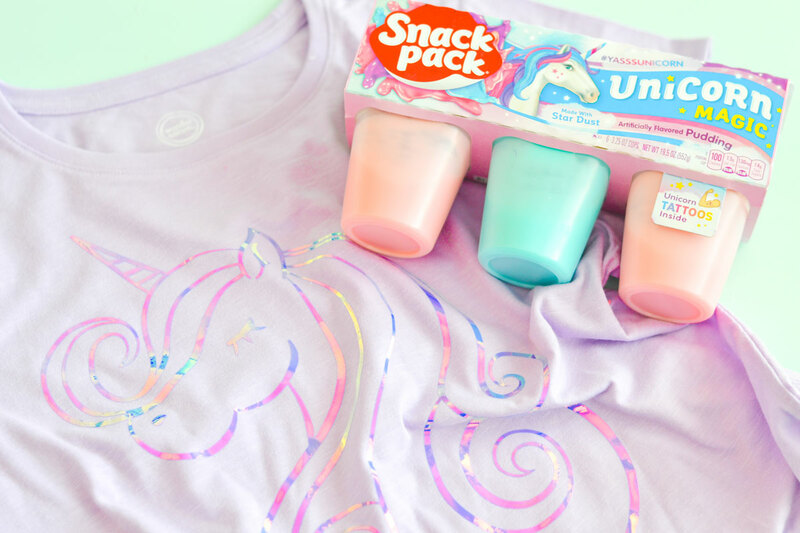 Enjoy your new Unicorn T-Shirt by eating some Limited Edition Unicorn Magic Snack Pack Pudding Cups available at Walmart. My daughter, Leila, is obsessed with Unicorns. She’s as obsessed as an almost 9-year-old can be, to be honest. 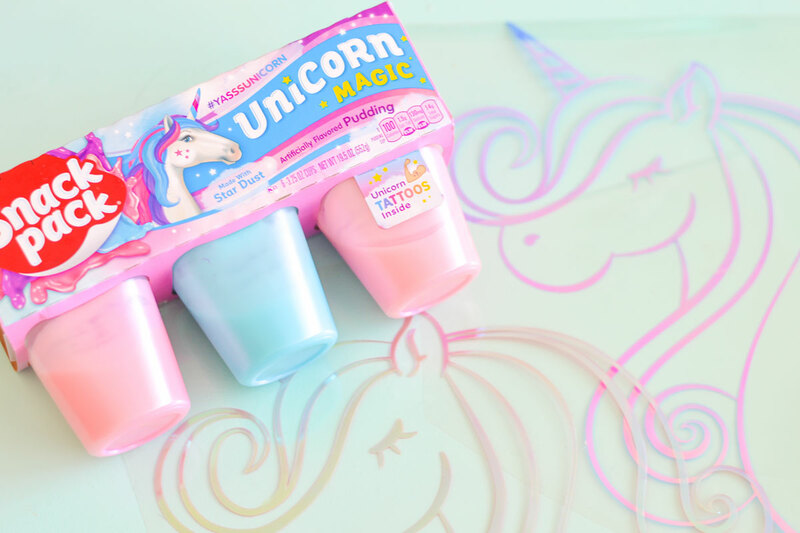 When I found these Unicorn Magic Snack Pack Pudding Cups at Walmart, I knew we had to have it. 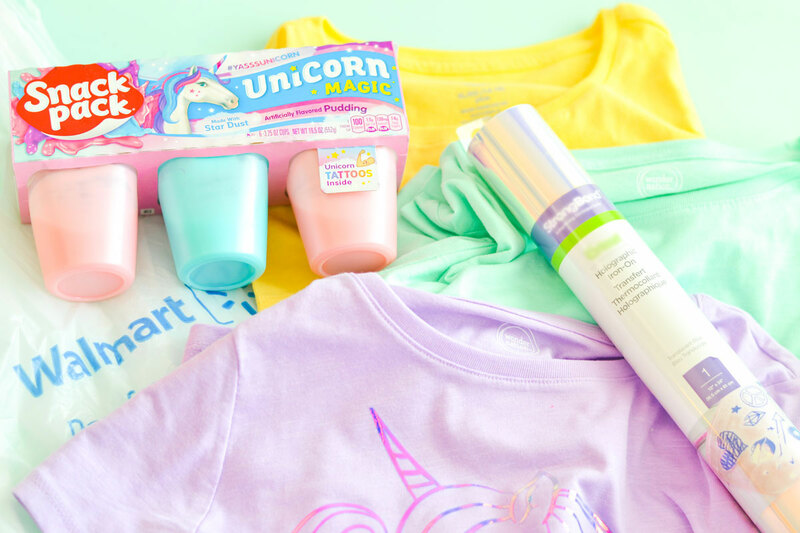 I swooped them up because they’re only available for a limited time and so while I was at Walmart, I grabbed everything else to make her this custom Unicorn shirt using my electronic cutter. Click here to get your free Unicorn SVG File. You’re going to begin by uploading your Unicorn SVG into your electronic cutting machines software. After you’ve uploaded your Unicorn SVG, you’re going to want to resize it to fit on your child’s shirt. Select cut and you’re going to want to make sure your image is mirrored so that it cuts correctly before applying your HTV to the shirt. Since this image does not have any writing, it’s ok if you forget. If you did decide to put some text on it and you didn’t mirror it, the text will be pressed backward on your shirt. 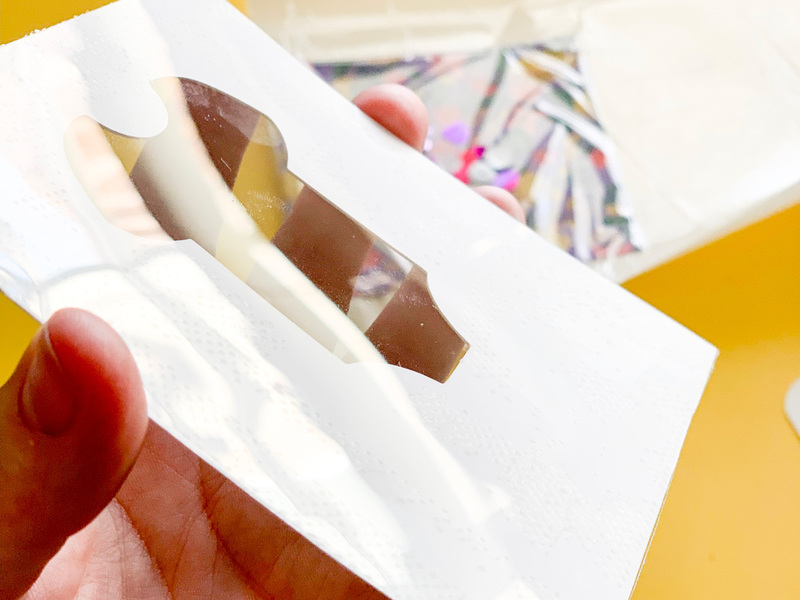 Holographic Vinyl is thicker than standard HTV so there are a few tricks to get it to cut cleanly. 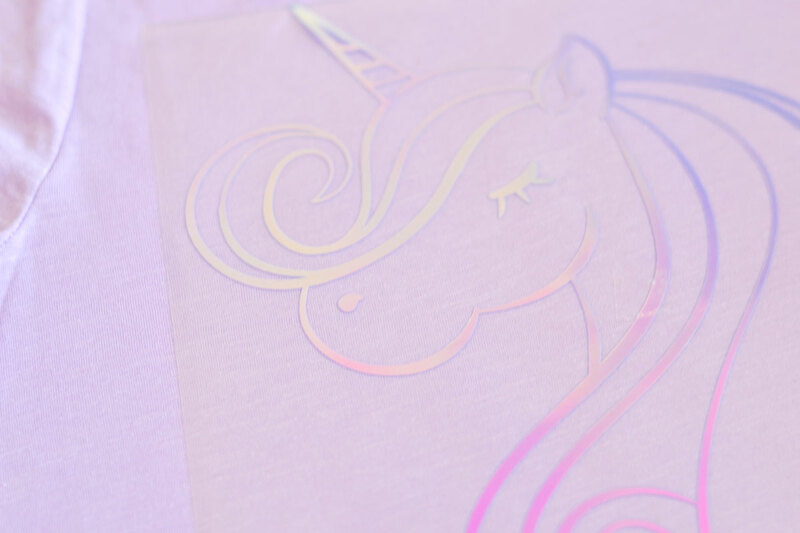 If you have a Cricut, cutting Holographic Iron-On is fairly easy. 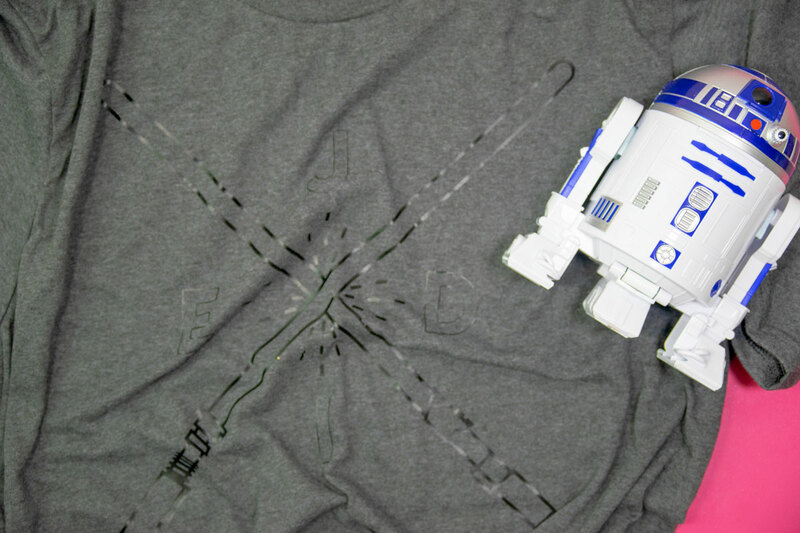 Cricut has a setting in Design Space where you will select the Holographic Iron-On and hit cut. On a Silhouette, cutting Holographic HTV is a little bit trickier. Since Silhouette doesn’t make their own, there really isn’t a setting for it. 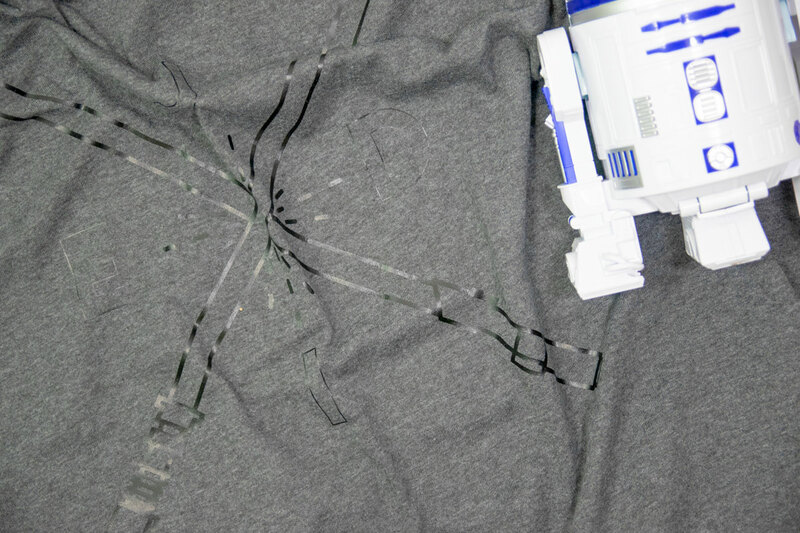 I chose the Heat Transfer, Metallic setting and my pressure up to 4 and it cut really smoothly. 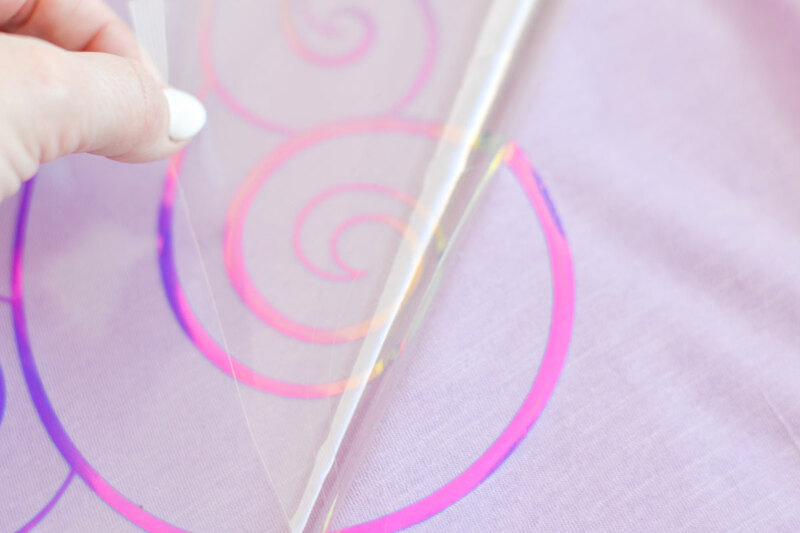 You do not want to cut completely through the carrier sheet when using your electronic cutter. The carrier sheet is there to protect your image from the heat and it also holds all the small areas in place while you’re pressing. Weeding is the easiest part of making your own shirts but it’s also the most time consuming depending on how many accent pieces you have. You want to keep whatever part of the image you want on your shirt on the carrier sheet. If you accidentally pull up a piece that should have stayed, just set it aside until you’re completely done weeding and then you can stick it back on the carrier sheet before you press your design. 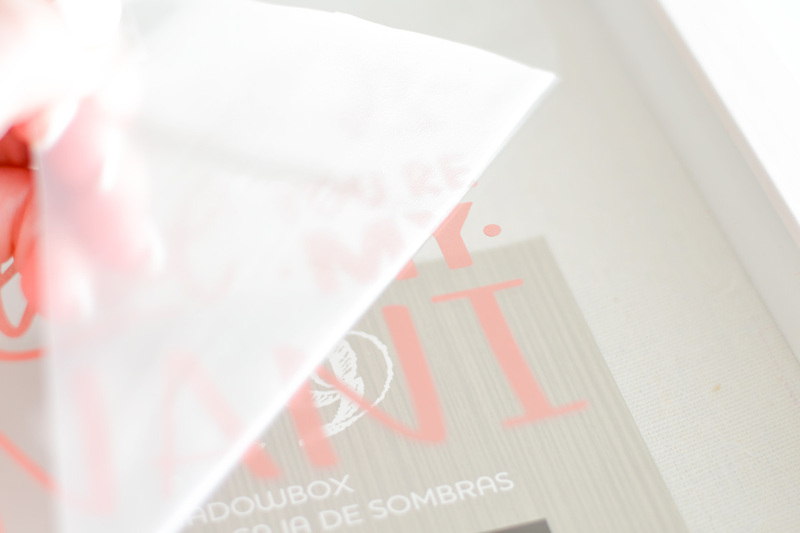 Because the holographic is a material laid on top of the holographic material, they can split a bit while weeding. Just peel slowly and you shouldn’t have any problems. To learn how to press vinyl using an iron, click here. If you’re going to be using an EasyPress, the heat you want for holographic vinyl is 330F. Preheat your cotton t-shirt for 5 seconds, lay your image down and you’ll press for 30 seconds, flip your material and press again for 15 seconds. You will want to remove the carrier sheet while the vinyl is still warm. If there are some pieces lifting, you can press for just a few seconds longer to get those spots to adhere. Click here for more EasyPress settings and materials to find out what setting you should be using. **Usually the heat settings are the same on a heat press as the EasyPress but double check with the manufacturer. Siser is a great website to visit for all heat settings, click here to learn Heat Press settings. 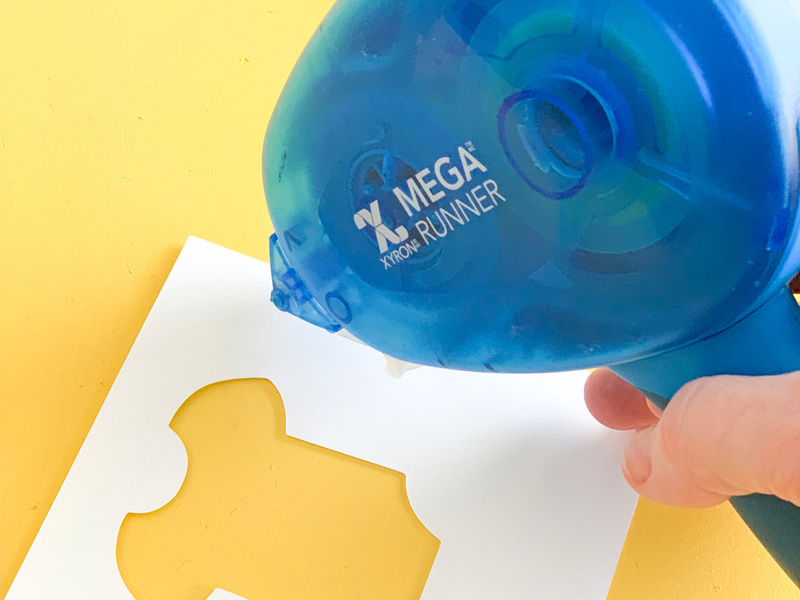 With any shirt you’re making, you want to preheat the fabric because this removes any excess moisture in the fibers and helps the HTV adhere and stay adhered. If you can’t decide if you are wanting to use an iron, EasyPress or a Heat Press, Hey Let’s Make Stuff has an awesome comparison for you. Allow your garment to cure for at least 24 hours before washing it. To wash your Unicorn T-Shirt, turn it inside out to wash and I like to hang dry my items to make sure the warmth of the dryer doesn’t cause the HTV to peel up. That’s it! 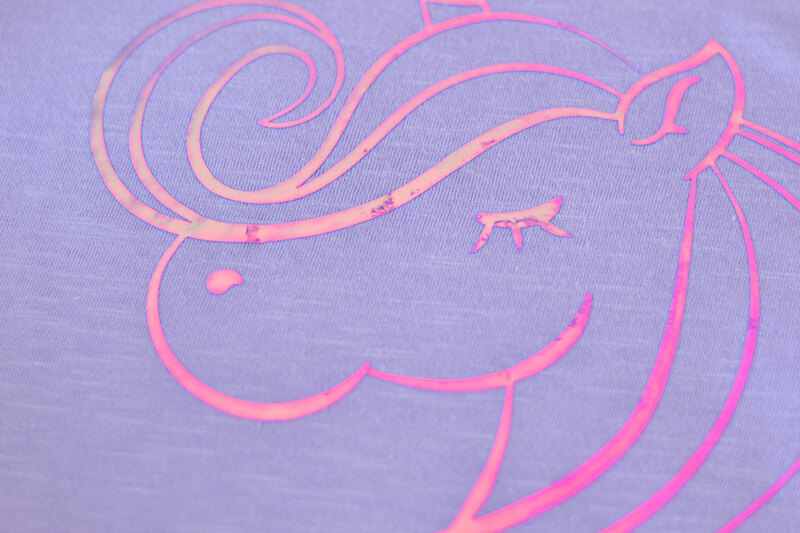 It’s so incredibly easy to make your own Unicorn T-Shirt using this free Unicorn SVG file. To find everything I used, head to your local Walmart and swoop up these items. 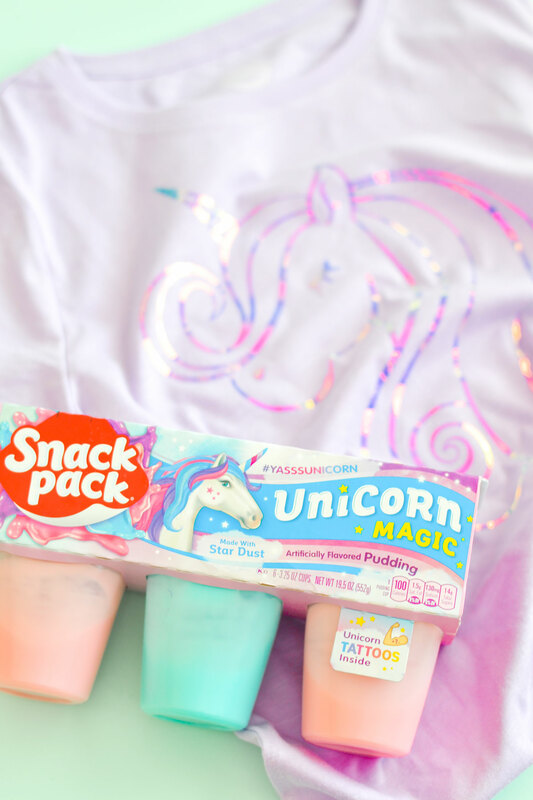 Be sure to grab the Limited Edition Unicorn Magic Snack Pack Pudding Cups and don’t forget the free tattoos inside! 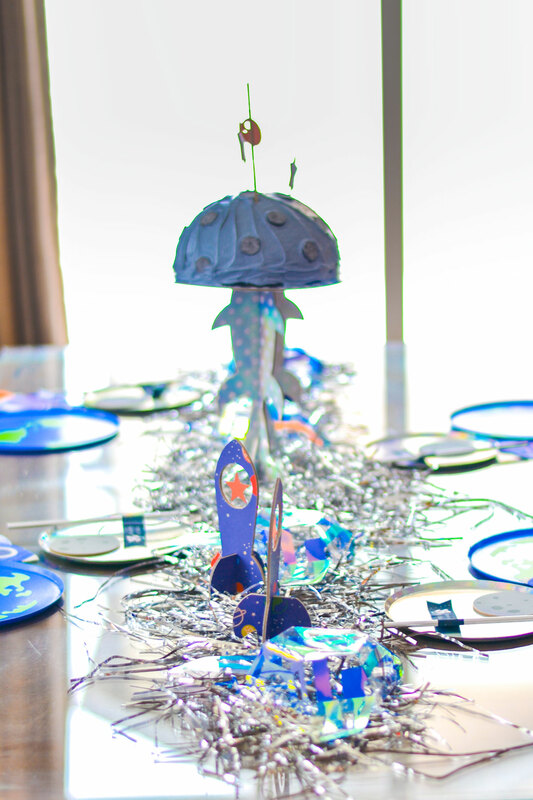 Make the most out of your magical day by using the printable family fun games that can be found on the Snack Pack website. 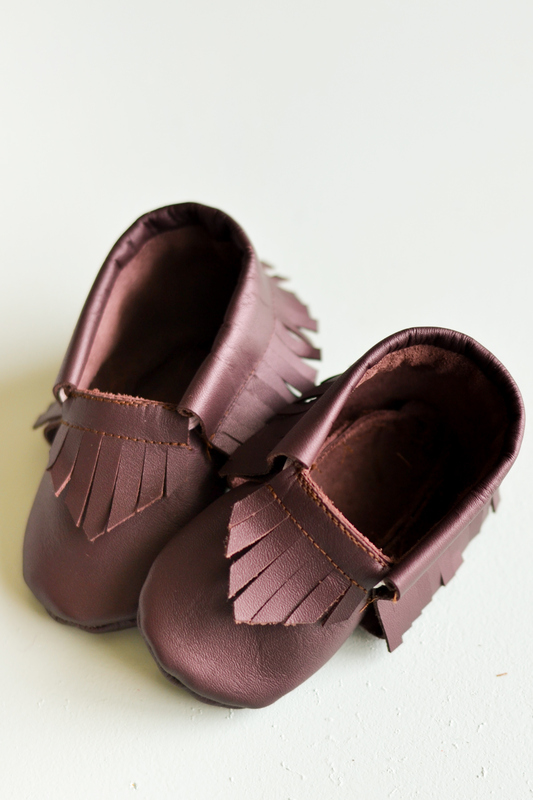 Infant Leather Moccasins are all the rage. 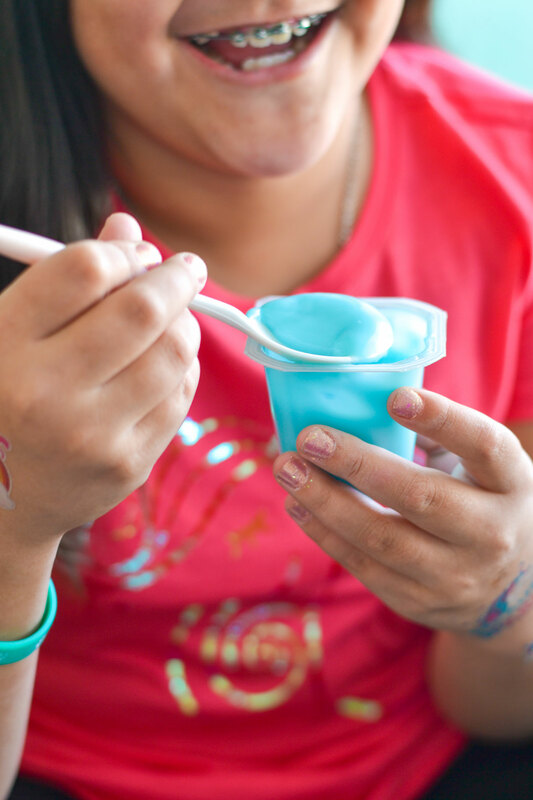 They’re incredibly easy and inexpensive to make. 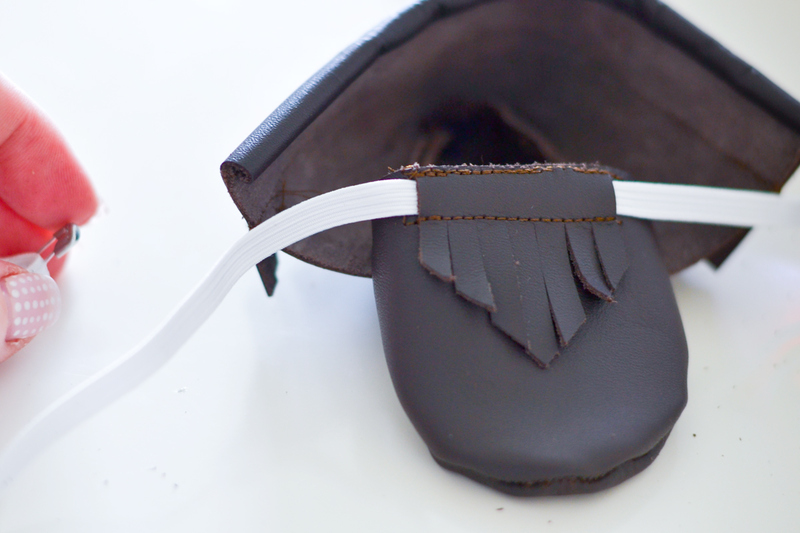 Learn how to cut Cricut leather with you Cricut Maker and make your own baby shoes today. My two youngest children had these shoes and they were really expensive to wear. If they’re a toddler, you can definitely get your money out of them but as an infant, they’re more for looks. 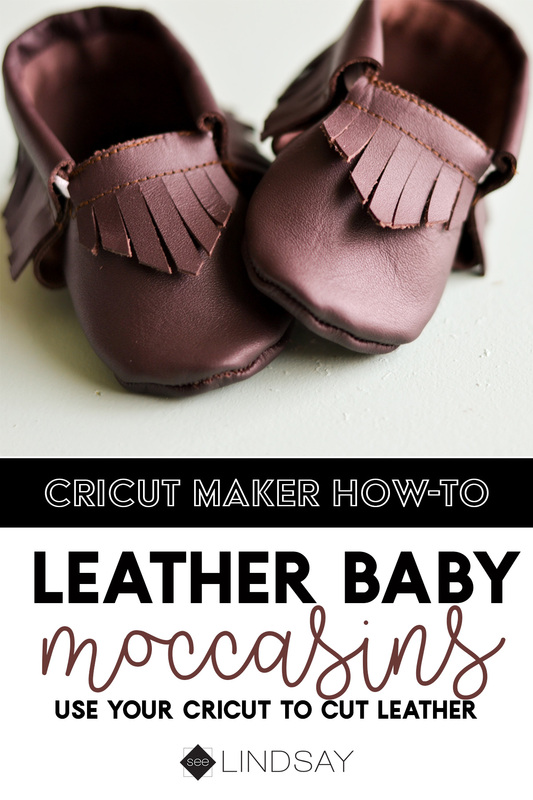 Use some Cricut Leather to create your own at a fraction of the cost and make those baby feet irresistible. 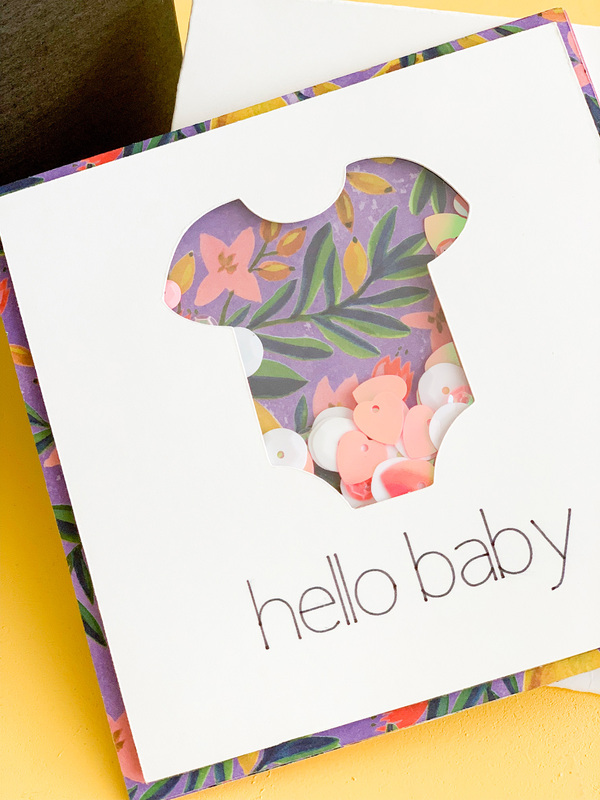 But your baby is going to be the most stylish baby in the block by using this leather moccasin pattern that comes with a Cricut Access membership. 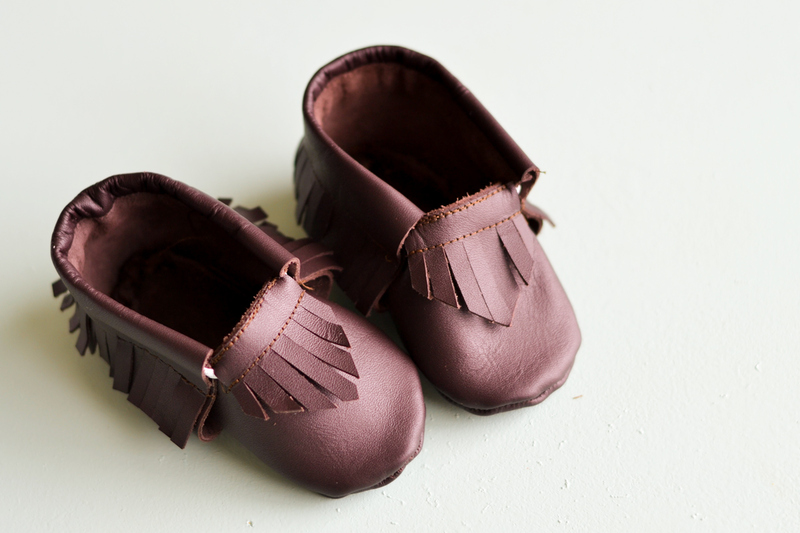 For these infant leather moccasins, you’re going to want to use a soft leather. You’re going to cut your vegan leather and animal leather the same way. I like Cricut Leather because it is soft and perfect for those baby toes. 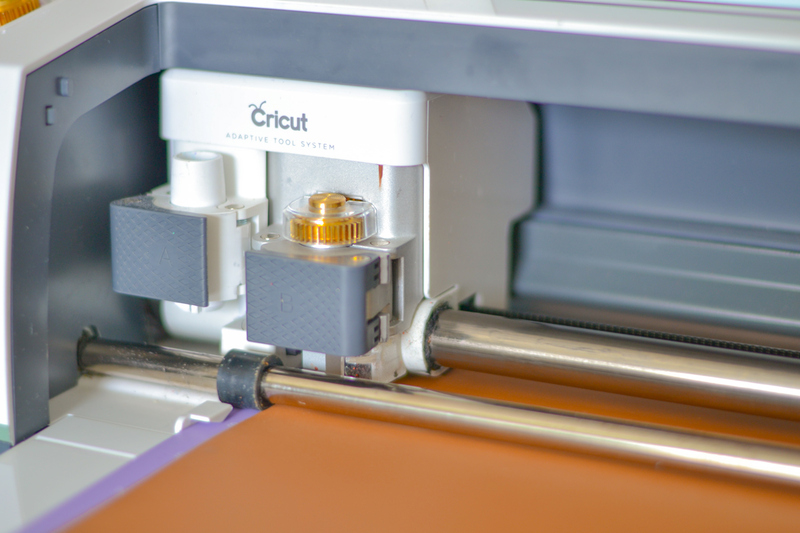 Step One – Lay your leather smooth side down on your Cricut mat. If you find that your leather is grainy or won’t stick to the mat well, lay some transfer tape on the fuzzy side and then apply that side down on your Cricut mat. You can also use some painters tape or masking tape to hold down the edges of the leather. Cricut recommends using the Strong Grip Mat but I have also used the Standard Grip Mat or the Fabric Grip Mat and it held fine. Cricut’s Genuine Leather is leather that I have found I like. The back has had most of the fuzz removed but it is still soft. Cricuts Genuine Leather is .4mm thick so it can be cut using the Deep Cut Blade but I 100% recommend using the Cricut Maker with the Rotary Blade or the Knife Blade. When you cut leather with the Cricut Rotary Blade, you get a cleaner cut. The rotary blade isn’t pulling the leather like the Deep Cut Blade would do and so you’re not going to go through materials quickly. Step Two – Open the Design Space project using this link here or search for it in Design Space. Move your small white rollers all the way to the right so it doesn’t make a mark on your leather. Place your Cricut Rotary Blade into your Adaptive Tool System and load your mat with the attached leather. Because the Genuine Leather setting does not allow you to choose the Rotary Blade, you’re going to have to adjust some settings. I chose to edit the material settings for canvas. I just adjusted the force setting to 400 so that it would cut cleanly through. I chose more pressure before I cut as well. This gives an extremely clean cut. If you’re using a desktop computer and you have the knife blade, use that. This is a way that you can kind of jimmy rig your mobile device to cut the leather just as good as the Cricut Knife Blade. Remove your cut baby shoe pattern from the mat and set aside. 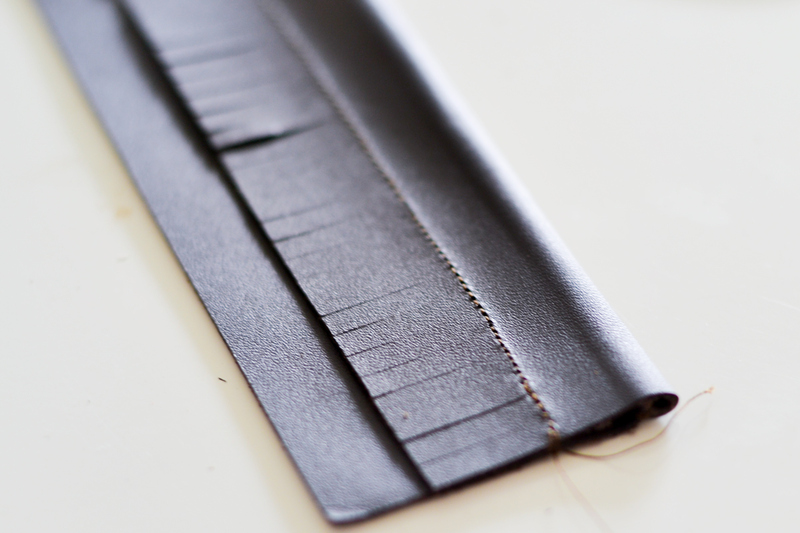 Step Three – Take the fringed back piece and the larger rectangle and sew them right side to the wrong side along the solid leather. Flip the fringes piece over itself and then create a loop so that the elastic will fit through. Sew about 1/2” from the top of the fringe piece. Step Four – Take the small fringe piece and the toe piece and sew it on top of each other. You’re going to want to have them laying right side up. Stitch right along the top as close as you can. Then about 1/4″ below that, stitch another straight line. Be sure to reinforce the edges of each stitch. 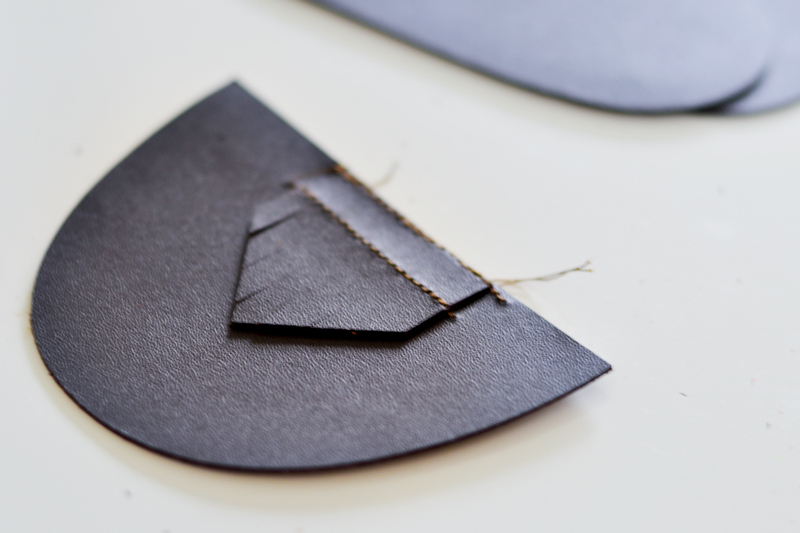 Step Five – Find the center of the sole of the shoe and the large fringe back piece. Follow along the curve and clip them together in place. 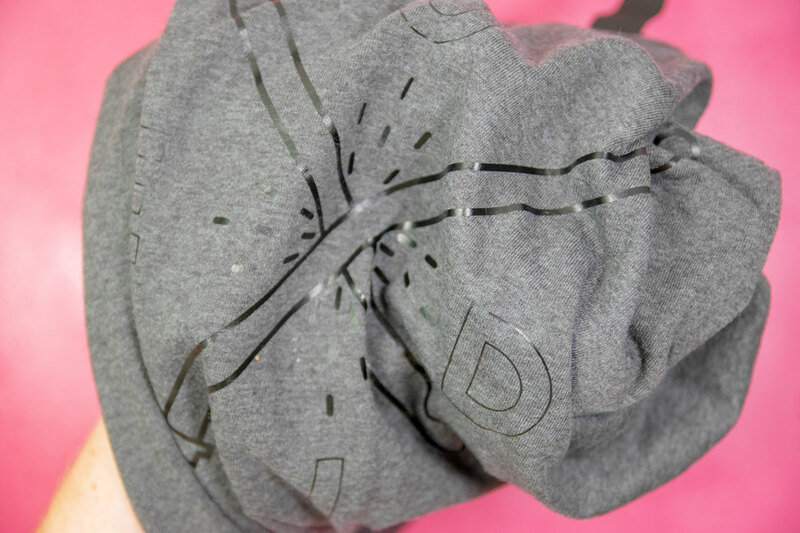 Sew a 1/4″ seam along the edges. Sometimes trying to get the Cricut leather to curve can be difficult. If you need to, just do the sides and then hand stitch the back curve, that works just as well. Step Six – Take the sole of the shoe and the toe piece and place them right sides together. Start by using a binder clip and place it in the center holding those two pieces together. 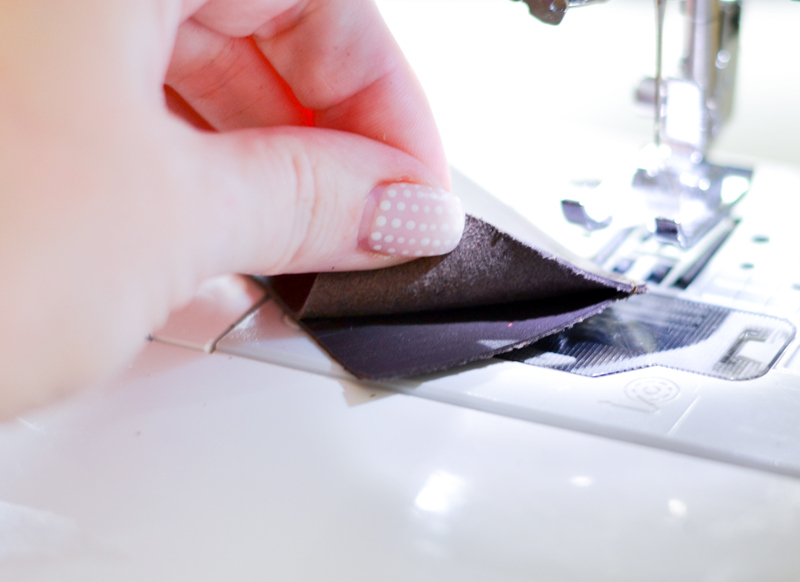 Then follow along the curve of the toe and begin by stitching the shoes together using a 1/4″ seam. Step Seven – Turn the shoe right way out and then use a dowel or a bone folder to push the leather seams out to smooth out the shoe. 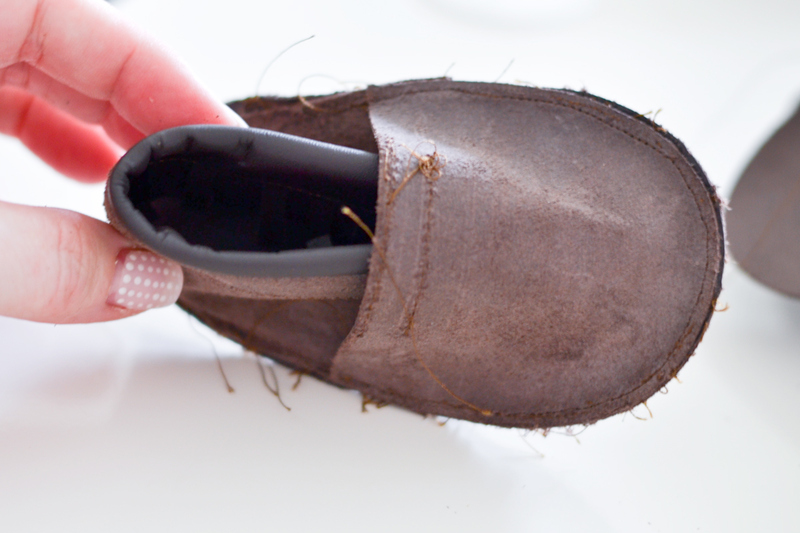 Take a small safety pin and thread the elastic through the shoe and pull them taught. Sew a zig-zag stitch across both ends together and then clip. Tug at the top of the shoe to try and shimmy the elastic so that the part where they connected is hidden. I like using my Rotary Blade to cut the Cricut Leather. If you have the Knife Blade, this will work just as well and I select the garment leather setting. To learn how to cut your Cricut Leather with the Cricut Knife blade, click here.